Once upon a time, fishermen had to step directly into the stream, river, pond, lake, or surf where he fished and face the reality of getting cold and wet–all in the name of the catch. Eventually, waders came along as an alternative to mucking up your boots and pants, but they were often heavy, poorly fitted, and barely water resistant. Modern waders come in a variety of styles, materials, and sizes to keep you warm and dry no matter where you fish. 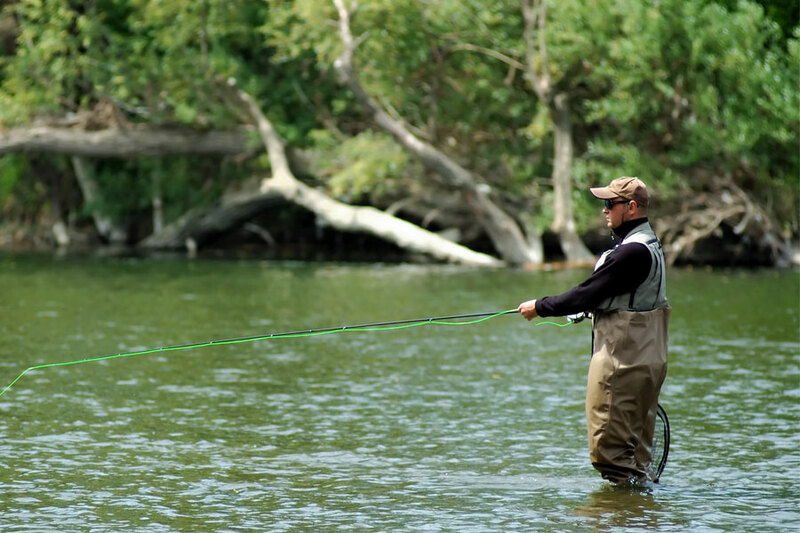 Granted, there is no such thing as the perfect set of waders that are ideal for any condition. Heavy-duty, suspender chest waders are great for stream fishing in the cool waters of early spring, but would probably cause you to overheat on the lake in the thick of summer. In order to decide on the best set of waders for your angling needs, consider how much coverage you want, whether you want attached or separate wading boots, and what type of material will best keep you warm (or cool) and, most importantly, dry. The Caddis Men’s Attractive 2-Toned Tauped Deluxe Breathable Stocking Foot Waders are, despite their name, more sporty than attractive. Nonetheless, they do what any good wader should: keep you warm and dry while fishing, clamming, or mucking around in the backyard pond. Employing the use of Caddis Dry technology, a breathable and waterproof Polyester outer layer wicks away perspiration without allowing outside water molecules to enter. All seams on the waders are taped, glued, and stitched, the knees are double gusseted, and the suspenders adjust to fit your frame. The front has a new quad pocket with built in hand-warmer and the high-density neoprene soles are oversized to allow room for extra socks in cold weather. Included with the waders are a wading belt, repair kit for holes and tears, and a mesh storage bag. 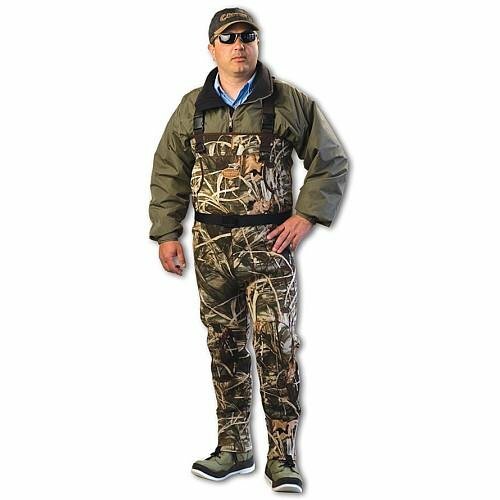 The Hodgman Mackenzie Nylon/PVC Chest Wader with Cleated Soles are a simple, lightweight, and suited for a variety fishing and outdoor needs when you need to stay dry. The 2-ply nylon and PVC shell is taped and seam sealed, and is much lighter than traditional rubber waders. This comes at the sacrifice of insulation, meaning the Mackenzie Waders aren’t necessarily the best for wading in particularly cold waters. The H-strap suspenders adjust to size and feature side-release buckles for easy on and off. Another drawback to these waders is the lack of any pockets or attachment points for your extra gear. The cleated PVC soles make up for the rest of the wader’s simplicity, as they are 25% more durable than rubber boots, flex to prevent chaffing, and provide a sure grip whether you’re clambering through muddy bottoms or trudging across loose, slippery stones. The Waterfowl Wading Systems Max-4 Neoprene Stockingfoot Waders in marshland camo are perfect for fishing and hunting fowl at any time of year. Combined, the tough outer nylon layer and interior neoprene are 3.5-mm thick, strong enough to prevent rips and tears but thin enough to keep you cool in warmer weather. Whether hiking though the woods to your marsh-side hunting blind or secret fishing spot, you’ll stay comfortable and your body temperature regulated in the WWS Max-4 waders. The waders have adjustable H-style suspenders with easy-connect buckles and gravel guard gaiters that clip to your bootlace to keep the leg of the waders from riding or bunching up. The front of the waders feature a large storage pocket with a built-in hand-warmer pocket along with two D-rings for hanging calls, sunglasses, or other hunting/fishing accessories.